Jesse Lipscombe is a self-proclaimed, professional passion follower. As a film and television actor for over 20 years working with some of the businesses best, a former professional athlete, ranked 6th in the world and a multiple business owner, it is fair to say that he has embodied that title. Most recently, co-founding the #MakeItAwkward campaign with his wife Julia, Jesse has set his sights on making waves of equality all over the country. With the most recent addition to their family, Jesse plans to continue being the best father, husband and inspiration to his family and beyond. Shawn Kanungo is a sought-after keynote speaker and strategist. Over the past decade with Deloitte, he has been recognized nationally and globally for his work in the innovation space. Shawn works with corporate executives to better understand and plan for the opportunities and threats associated with disruptive innovation. Shawn is on the ground floor helping private and public sector organizations adopt new technologies and business models for the digital age. In 2016, he was recognized as Avenue Magazine's Top 40 Under 40. He is currently co-host of The Dip, a podcast focused on strategy, marketing and innovation. Marilène works at a crossroads somewhere between new digital technologies, traditional print and sculpture, her finished objects bridging the virtual and the real worlds. She works with the body translated into data form in order to understand how it has become 'unfleshed', in the hope of understanding who or what it has become. Oliver uses various scanning technologies, such as MRI, CT and PET, to reclaim the interior of the body and create works that allow is to materially contemplate our increasingly digitised selves. Marilène Oliver was born in the UK in 1977 and studied Fine Art at Central Saint Martins and then at the Royal College of Art where she obtained an MPhil with the practice based research project ‘Flesh to Pixel, Flesh to Voxel, Flesh to XYZ’ on the use of medical imaging in contemporary art and is currently completing an MSc in Medical Imaging at the University of Edinburgh. Oliver has exhibited widely in the UK and Europe in both private and public galleries including the Royal Academy, MassMoCA, Casino Luxembourg and Glenbow Museum. Her work is held in a number of private collections around the world as well as a number of public collections such as The Wellcome Trust, Victoria and Albert Museum and Knoxville Museum of Art. She is currently an Assistant Professor of Printmaking at University of Alberta. Nasra Adem is a 22 year old queer, Muslim, multidisciplinary artist, community organizer and activist. She is the current Youth Poet Laureate of Edmonton and curator of Sister 2 Sister: an artist collective for/by femmes of colour and Black Arts Matter-Alberta's first all Black arts festival. Nasra is passionate about using art to disrupt, protect, educate, inspire and build forward moving love within her communities. She also graces this month's cover of Avenue Edmonton. Jared Smith is a co-founder of Incite, an Edmonton-based strategic growth marketing firm with clients across Western Canada. As a proud graduate of the University of Alberta School of Business, Jared forged partnerships on behalf of the University in 1997 while in China—an experience that ignited his entrepreneurial spirit. His passion to align with like-minded people, organizations and boards—those that are ethical, innovative, and community minded—are the reasons he co-founded the Tour of Alberta, Chairs the Edmonton Mayor’s Business Roundtable, was president of the Entrepreneur’s Organization and is the Honourary Co-Chair of the Glenrose Courage Gala. Jared advises senior leaders in high-growth organizations and speaks to, moderates, or facilitates many business events across Canada each year. These efforts led to him being named “Entrepreneur of the Year” in 2001 by the Edmonton Chamber of Commerce and one of Avenue Edmonton magazine’s notable “Top 40 Under 40” in 2009. Jared is a 3rd Degree Black-belt in Karate and recently volunteered to endure a year-long training simulation that culminated in a weeklong suffer-fest with Navy Seals in SanDiego. His greatest adventure, though, is the one he enjoys each day with his wife Jessica and their two children, Madeline and Kai. From marketing to finance to operations, Christian has managed nearly every aspect of an organization. As an advisor to businesses and non-profits, he brings a wealth of experience and knowledge to organization leaders seeking ways to unlock their growth. He challenges those leaders to think differently about their organization’s purpose and how to fulfill it. Christian has worked with some of the world’s most recognized companies, including award-winning campaigns with Mercedes-Benz and Dell, and the global equity research team at UBS. He is now focused on building the capacity of organizations seeking growth in times of change as a Partner at Mison Idicula, a strategy advisory firm. 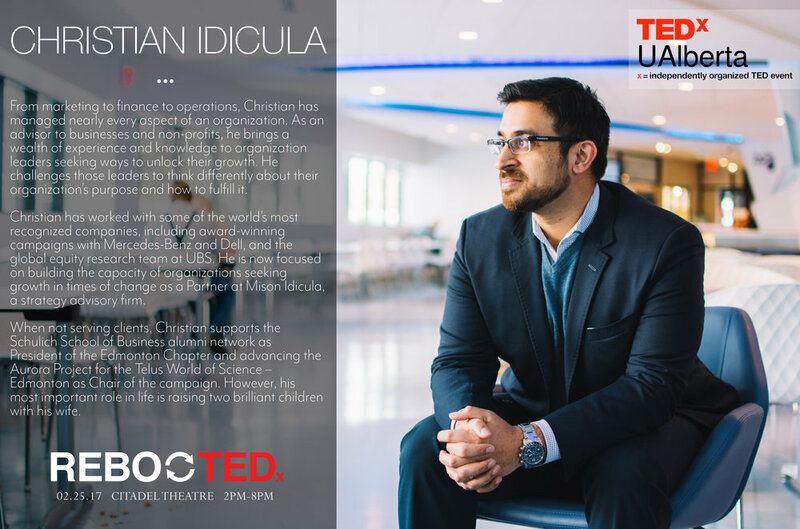 When not serving clients, Christian supports the Schulich School of Business alumni network as President of the Edmonton Chapter and advancing the Aurora Project for the Telus World of Science – Edmonton as Chair of the campaign. However, his most important role in life is raising two brilliant children with his wife. Kathryn Lennon works as a planner with the City of Edmonton's CITYlab team, on fresh: Edmonton's Food and Urban Agriculture Strategy. She also works with the Edmonton Food Council. She holds a Masters of Arts in Planning from UBC’s School of Community and Regional Planning, where her work focused on youth-driven, community-based public space activation in Vancouver’s Chinatown. She also holds a Bachelors of Environment and Resource Studies from the University of Waterloo where she focused on race and multiculturalism in relation to alternative food movements. Kathryn loves sampling street foods of the world and exploring Edmonton's food gems. I am the youngest son of eight; my mother and father are Grace and William Desjarlais. I was raised my entire life at the Fishing Lake Metis Settlement, one of eight Metis Settlements in Canada. Fishing Lake is located approx. 300 km east of Edmonton. My community is comprised of 500 Metis people who have lived here for nearly 100 years following my peoples mass displacement that came along with Canadian expansion. I attended our community elementary school from kindergarten to grade 6 after which I was required to bus to the nearest Jr. High school which is 50 Km west for the remainder of my secondary education. Living in Fishing lake, with our unique customs and practices, is one of the most precious gifts and experiences a Bush Metis can have. Following secondary school in the predominantly white town of Elk Point, it had always been my dream to go to University and do my best to understand the complex world my people have found themselves in. I had always know we were different, from our housing shortages to high unemployment rates I had know we were not apart of the prosperity that many Canadians seem to enjoy. I graduated with a degree in Political Science from the University of Victoria and had the opportunity to serve as an Indigenous student leader and advocate. Today I serve all eight Metis Settlements as the Director of Public Affairs for our people government, the Metis Settlements General Council. Greg Dewling has been in the building business most of his life; from go-carts and treehouses to moulding and shaping the lives of youth and young adults, Greg’s passion for growth and development has fueled his desire to build the lives of some of the most vulnerable individuals in our society. As CEO of Capital Region Housing in Edmonton, AB, he has been improving the well being of over 9000 families in the Metro Edmonton region through building quality homes and inclusive communities. Greg knows we can’t keep doing things the same way – the infrastructure of social housing is racing towards a cliff like an out-of-control freight train; if we do nothing, the homes will be uninhabitable. He suggests a reboot; focus on both the social program and real estate of social housing. By investing in people and property, everyone can find an affordable place to call home. Chair of the board of directors for the Chartered Institute of Housing Canada and serves as vice-chair on the board of directors for the Trans Alta Tri Leisure Centre in Spruce Grove, AB, Greg is the past President of Alberta Public Housing Administrators Association and served on the Interagency Council for Homelessness with the Ministry of Human Services. Luca Petryshyn is an Edmonton-born and raised prairie Ukrainian. He is passionate about applying simple tools that can help organizations solve complex problems. After studying, working and living on four different continents, he moved back to Edmonton to pursue a career in strategy and operations. Since returning he has worked as a craft brewer, a communications consultant, and as a public servant. He is currently working as an Effective Practices Specialist for the government of Alberta where he gets to improve user centered design and systems thinking in government services. In his spare time Luca sits as a board director on the Alberta Foundation of the Arts, facilitates workshops on behalf of the Board Development Program, and DJs late night Sundays on Edmonton's best radio station CJSR. Per last album was heavily influenced by Indigenous Studies and per times on the front lines. Quetzala studied Māori Studies at the University of Otago and is currently finishing per degree in Native Studies and Latin American at the University of Alberta. There Quetzala serves at the president of the Native Studies Students' Association where pe organizes with students towards decolonial futures. Dr. Sarah MacDonald is a Forensic Psychologist and published author who conducts research examining cognitive processes underlying investigative interview techniques, psychological-based investigative practices, deception detection/credibility assessment, and memory. She is certified in Advanced Cognitive Interviewing (British Police, UK) and has since taught this course (the first of it's kind in North America) to Canadian police officers in Major Crime who interview significant witnesses and victims of crime. Presently, Sarah works with the Sheldon Kennedy Child Advocacy Centre in Calgary as an Investigative Interviewer and works closely with the RCMP and Calgary Police on cases of child sexual abuse. She is a strong advocate for evidence-based, scientifically sound interview training programmes. Jonathan Schaeffer is the University of Alberta's Dean of Science and a professor in the Department of Computing Science. His research is in the area of artificial intelligence, inventing algorithms that facilitate computers achieving high performance at human tasks. Much of his research has been demonstrated using games. His checkers-playing program Chinook was the first computer to win a human world championship (1994), a feat recognized in the Guinness Book of World Records. He has helped develop superhuman programs at poker (two-player limit Texas Hold'em -- also in the Guinness Book of World Records). He is co-founder of the University of Alberta not-for-profit spin-off company Onlea (onlea.org) that creates engaging online learning experiences. Daniel Laforest is a Quebec-born professor of French and cultural studies at the University of Alberta. His work is situated at the crossroads of literature and medical humanities. He has been Visiting Professor at the Stanford University Center for Biomedical Ethics, and is an alumnus of the Fulbright Foundation, as well as of the Banff Centre Leighton Artist Colony. His award-winning non-fiction writing and multimedia online projects explore the untold connections between the stories we tell and the material world we live in. Daniel believes that true creativity begins with the breakdown of the hierarchies between knowledges, experiences, and everyday things. He is passionate about interdisciplinary storytelling and its potential to transform the textures of our communities. Daryl is the newly appointed Artistic Director of the Citadel Theatre. He comes to Edmonton from Kamloops, BC where he served as Artistic Director of Western Canada Theatre for six seasons. Daryl’s recent directing credits include: Love’s Labour’s Lost (Bard on the Beach), Liberation Days (Theatre Calgary), In A Blue Moon (Arts Club), Mary Poppins (Persephone), Tribes (Canadian Stage), And All For Love (National Arts Centre), Generous (Tarragon), and Afterplay (Shaw Festival). Previous to his appointment at WCT, Daryl was the Founding Artistic Director of Theatrefront in Toronto, where he directed numerous international collaborations including: RETURN (The Sarajevo Project) - produced in Bosnia and Toronto; and UBUNTU (The Cape Town Project) - produced in South Africa, Halifax, Toronto, Calgary and Vancouver. Daryl’s work has been nominated for Dora Awards (Toronto), Betty Awards (Calgary), SATA Awards (Saskatoon), and Jessie Awards & Ovation Awards (Vancouver). He has been awarded the Canada Council's John Hirsch Prize for Outstanding Emerging Theatre Director, the Toronto Theatre Emerging Artist Award, and a Robert Merritt Award for Outstanding Director (Halifax). Daryl is now a proud resident of Edmonton, where he lives with his wife Holly, and their two sons Liam and Jack.